The eyes are perhaps the most misused, ignored and overused part of the body. We use it while working in front of the computer, staying connected throughout the day via our mobile phones and tablets and even while entertaining ourselves watching movies and videos. Until we feel there’s something wrong, we tend to ignore our eyes because they are just there. Now, more than ever, our eyes suffer even more abuse. According to Dr. Joy Go, assistant vice president for marketing and merchandising of Ideal Vision Center (IVC), Because of all the electronic gadgets we use continuously throughout the day IVC deemed it necessary to upgrade its campaign from combating computer vision syndrome to digital vision syndrome. “In the early 2000s, we had PCs so we’re talking about computers then. But now that almost everyone has a smartphone or a tablet, our eyes are constantly exposed to harmful blue light and at such a close range that they are easily absorbed by our eyes,” said Dr. Go, a graduate of optometry from the Centro Escolar University. Since she became a doctor and joined the family business, she has been involved in various eye health care campaigns to educate the public on the importance of eyecare and prevention of vision problems. She added that proper distance from the computer should also be observed. “It helps a lot. Kasi hindi lang mata ang masisira, pati ulo at likod.” It is a must to blink and rest our eyes from time to time. As a testament to their advocacy campaigns, IVC has been working with Essilor, the leading ophthalmic company in the country, for more than three decades now. Both companies share the same vision of raising awareness on proper eye care. The partnership also helps IVC provide advanced products to their clients. Among the Essilor brands available at Ideal Vision are Crizal, Essilor’s flagship brand that provides complete protection against harmful UV rays; Transitions, the leading photochromic lenses that adapt to the changing light indoors and outdoors; and Varilux, the world’s most advanced progressive lens for those 40 years old and above. Dr. Go is hopeful that one day, people will realize how important vision care is. 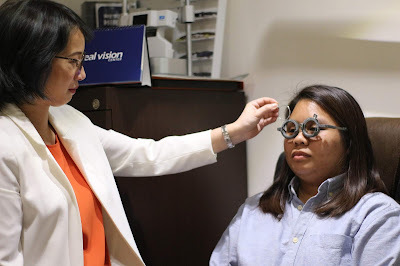 She considers it a challenge and finds the thrill in finding new ways to raise awareness on quality eye care for Filipinos.